This series of questions from Garry are excerpts from 1:1 phone and email counselling and consulting sessions with me over a two month period. Garry and his family went through many challenges while his Dad was in Intensive Care and I felt very privileged helping Garry through this difficult time in his and his Dad’s life! My Dad is 57 years of age, is currently on a ventilator in ICU and is in an Induced Coma since arriving to the hospital almost 4 weeks ago, He was brought in with Severe Pneumonia. He is now apparently in Multi Organ Failure. I have so many questions that are not getting answered and I have so many concerns… hopefully you can help me! A bit more detail: He was brought to the ER with reports of difficulty breathing, he had no idea he had Pneumonia until arriving by Ambulance, they immediately intubated him, placed him in an induced coma and transported him to ICU, where he has been ever since. Initially, they got the Pneumonia stabilized and a bit better with antibiotics and daily Bronchoscopy procedures and he started to improve, but then his vitals crashed, he became worse and he was becoming increasingly difficult to ventilate. 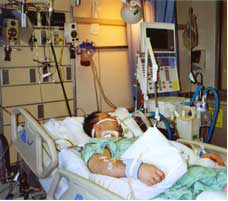 They had to adjust his ventilator settings several times to get it right, and at one point we were called in as we were told he might not make the night. This was around the two week point of him being in ICU. After this happened they took him for a chest x-ray and it appeared that he had an enlarged heart, much bigger when he first arrived, and they literally cannot explain why… they called it Cardiomyopathy. Things improved after this point, in terms of his Oxygen saturation and general vital signs. However, he was not “tolerating” the daily feedings via a nasogastric tube through his nose in to his stomach, and the Pneumonia was not getting any better. He was also retaining fluid and became visibly swollen. It’s now almost 5 weeks, and I rang the hospital yesterday for an update to things, as I do daily, and I was told things are not great, and that he now appears to be in Multi organ Failure. Mainly with his Heart and lungs, but his liver is now also affected. I was told the consultant wants to speak with me and the rest of the family to discuss things and that the team are at in “impasse” – but apparently can’t meet until next Tuesday (it’s Friday now) – that’s a mixed signal to me, they are saying he is not in a good state, but the consultant cannot meet until next Tuesday. Surely if it’s a serious situation they would meet with me ASAP. Whenever I go in to see him, the nurses only give me brief updates like “he’s not doing great” or “no change” – I feel like I have to “pull” the words from their mouth to get any sort of information from them. I don’t know what to do, or what I can do from here. What questions should I be asking the Doctors and Nurses? – What exactly could the Consultant want to speak with me about? – Would there be anything more that they can do to “fix” the situation? Is there anything that they are not doing, that they should be, as it seems that all they are doing is keeping him sedated and on a ventilator and nothing more. Why are his organs failing, when it was initially only his lungs affected at first? I guess I’m expecting the “worst case scenario” when I go and speak with the consultant, as in, he is going to tell me that they can’t do anything more for my Dad and that we need to decide if we should continue supporting him. Already thinking about it, for me, I would want everything that’s possible, to be done to help save my Dad’s life. He is only 57 and always had a healthy lifestyle up to this point, he loves life and I know he would want everything that’s possible done to save him. Also, is there a need for him to be that heavily sedated the way he is? – it’s been over four weeks and he has been sedated since. he doesn’t even know what’s going on… that’s the sad part. The last thing he would remember is being in an ambulance 4 weeks ago… could there be some way that he could get a tracheostomy? And be conscious? Is this the typical sort of care to except from ICU and Pneumonia, now with multi organ failure? Is this the typical course of treatment, or, what is the typical course of treatment? Before I get into my response to Garry’s initial email when he first made contact, I need to point out that his Dad in his difficult and life threatening situation ended up in a small three bed ICU, which turned out to be part of the problem, as they weren’t equipped or had the experience to deal with such a complex situation Garry’s Dad was facing. 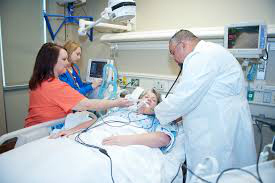 It’s just more context around an already complex and difficult situation and as a side note, if your loved one is facing a difficult situation in Intensive Care, you want to ask yourself the question if the ICU has the know-how, experience and resources to deal with whatever a critical illness throws their way! If you think about it, a three bed ICU will never see as many critically ill and complex Patients than a bigger ICU in a metropolitan area. Therefore my recommendation is to look for warning signs early on if you think an ICU has all the resources, equipment and know-how, how to treat and also how to escalate treatment if warranted! If you are in doubt that your critically ill loved one is in the best possible hands just contact us at [email protected] or call on one the numbers on the top of the website. So here’s my response to Garry. thanks for making contact and thank you for your questions. I also want to thank you for using my 1:1 counselling and consulting service! I’m very sorry to hear what you, your family and your 57 year old Dad are currently going through! Your Dad is dealing with a very complex situation especially with the Cardiomyopathy, the Pneumonia and potential Multi-organ failure. I know I can help you, answer all of your questions and guide you in the right direction, especially when it comes to asking all the right questions with the Doctors and the nurses. There are two things that stand out to me Garry and I strongly believe are part of the dilemma you and your family are facing! Your Dad is in a three bed ICU and I strongly feel that they are not capable looking after your Dad properly with such a high level of acuity and critical illness! For now, even though the situation sounds difficult and challenging you need to stay positive. Here is a link to an article/ video that will help you to stay positive. You have also correctly pointed out that your Dad is way too young to be given up on. Therefore you need to make sure that you can challenge the Intensive Care team and their negative assumptions. I can help you to do that and I can help you to find the right treatment and therapy options for your Dad. 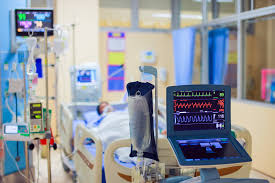 I also can tell you from experience that even though the situation looks pretty grim that Intensive Care teams are not the best communicators and don’t necessarily communicate straight away. Their mainly “hidden agenda” is not your agenda and therefore they want to remain in charge of the communication, the meaning of the situation and the outcome. 99% of the families in Intensive Care are completely oblivious to this… Therefore it’s good that you are seeking help and I can guide you in the right direction how you can make informed decisions, get peace of mind, control, power and influence. 1. Get your Dad a tracheostomy as quickly as possible! Given that it’s been 5 weeks after mechanical ventilation and induced coma with Pneumonia, Cardiomyopathy and the potential for multi-organ failure he needs to be in a position to “wake up” as quickly as possible. 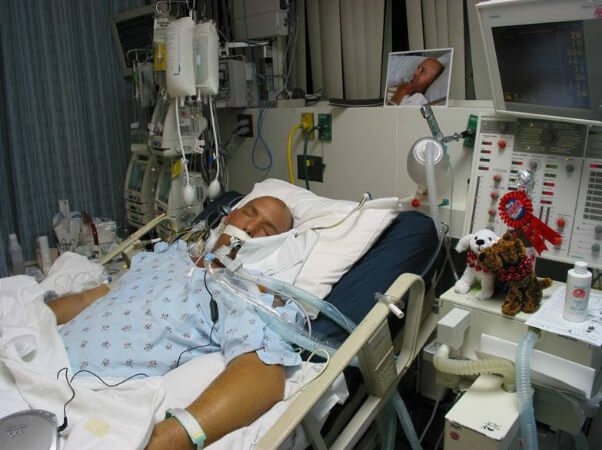 A tracheostomy is enabling your Dad to get out of the induced coma. I’d say that it’s negligent not to do a tracheostomy after 5 weeks in an induced coma and they need to be called out on it! That’s why I have been saying to you after I found out that your Dad is in a three bed ICU that they have limited to no experience to deal with such a complex situation with Cardiomyopathy, Pneumonia and Multi-organ failure. Leaving your Dad in such a complex and difficult situation for 5 weeks without performing a tracheostomy, is again, negligent to me! By doing a tracheostomy they could have reduced or eliminated sedation and therefore improved his hemodynamic status which would have been vital for your Dad whilst battling Cardiomyopathy and Pneumonia! I hope that helps for now Garry, we will be going into more detail and what needs to be done on our next call!